After a wave of occupations - and a crack down from police and university administrations - the British student movement is back. Reports of the death of the student movement have been greatly exaggerated. Students in Birmingham occupied a management space on the 20th of November. Then Sussex went into occupation, then Edinburgh. Birmingham sparked a wave of occupations across the UK. Many in established leftwing campuses – Sussex, Edinburgh, Sheffield – others on campuses with a less radical recent history, like the University of Ulster. About a dozen campuses have been occupied in the past few weeks. At first glance, it looks like a repeat of the 2010 student revolt. It’s not. There are similarities, but many differences. This movement is already much more sophisticated. The class of 2010 has graduated. Students who were 15, 16, or 17 when Millbank Tower was stormed now make the up the bulk of the movement. For this generation the groundwork has already been laid. The debates about the legitimacy of occupations were settled before they first set foot on campus. We’re much more aware of the student movements’ strengths and weaknesses. We have a clearer understanding of their relationship with workers, with management, and with the state. The context is different too. In 2010 ‘austerity’ was a niche word. The labour movement was stagnant. A few people still had respect for the Lib Dems and believed that a vote at the ballot box was enough. That’s no longer the case. Three years into the Coalition Government, public opinion has changed. The trade unions are flexing their muscles. Somewhat inevitably, the state is responding with brutality and political repression. The student movement’s strength and energy often transcends to other movements too. The 2010 student movement gave vitality to the fight against austerity. We lost our key demands but its legacy lives on. What’s happening now could play a similar role in shaping future movements. There are five keys things we need to understand about the current situation, why it’s happening, and what it all means. Workers pay is central to the movement’s demands. The occupations were organised to coincide with campus strike action, and they adopt the unions’ demand. Some go further, calling for the pay ratio between the highest and lowest paid staff to be reduced to 10:1. This is being played out against a backdrop of ubiquitous support for strike action, even amongst more moderate students’ unions. This is new. In 2010 the demands were student-focused: to save EMA and keep the cap on university tuition fees. The year before, education workers had also gone on strike but student union support was minimal. The big change we’ve seen in the student movement in recent years is the rise of the National Campaign Against Fees and Cuts (NCAFC) and campus anti-cuts groups who emphasise student-worker unity. Back in 2010 we were chanting ‘Students and Workers; Unite and Fight’. For the class of 2013, the chant goes without saying. In 2009 students occupied in reaction to the Israeli offensive in Gaza. Next it was in response to course closures. In 2010 it was about tuition fees and EMA. In 2013 these protests are not reacting to one single event but rather to a constellation of continuing political processes: the marketization of education, the corporatisation of university governance, and the casualization of labour. 2010 was reactive. 2013 is proactive. This recent surge comes from an act of collective will. We’ve shown that we can flex our muscles when we need to. In 2010 we knew what we were against. Now we know what we are for: free and accessible education, democratic institutions, decent pay and conditions for all workers. The anti-austerity movement hasn’t yet developed a strong positive narrative. The student movement is beginning to. We recognise the enormity of our task and we’re under no illusions of our strength. We’re self-consciously ‘movement building’. Every occupation and every demonstration strengthens us. There’s widespread recognition that another flashpoint like 2010 will happen. We want, and more importantly, we must, be better prepared. We’re building resilient organisations, equipping ourselves with stronger ideas, and finding more effective ways to organise. More importantly though, we recognise that this is what we’re doing. We are building a sustainable and organic movement and know that these elements are crucial. It’s not just about economics. The class of 2013 are fighting for liberty and democracy. The first occupation in Birmingham demanded change in university governance, bolstering the power of elected students and staff. More specifically, the occupation of the University of London’s Senate House was in part a response to the university’s plan to shut down its students’ union. The movement has evolved beyond ‘anti-austerity’. Money still matters but so does power. The past decade has seen universities become increasingly corporate, with Vice Chancellors acting like CEOs, and the gap between private companies and public universities collapsing before our eyes. At the same time the state has curtailed more and more of our liberties. The student movement is tackling austerity and authoritarianism simultaneously. The Coalition Government is pushing forward with more and more cuts. At the same time, it’s also attacking civil liberties through draconian measures like the Gagging Law. The student movement’s dual-approach will become increasingly important. Universities and State responses to the occupations and protests have been brutal and repressive. This is a big gamble. They are hoping that this will quash future dissent. But they risk adding fuel to the fire, pushing more students to protest, and other citizens alongside us too. Management at the University of London invited the Metropolitan Police to evict the peaceful occupation of Senate House. This led to false-arrests, assaults against students, and similarly brutal response to a march the next day. Approximately forty students have been arrested. The bail conditions prevent students from going within fifty metres of SOAS campus (despite this including their places of work or study), or ‘being in a group of four or more persons’ in a public place. But this policy is backfiring. The Facebook page calling for a day of action against police brutality has already gained 1000 attendees less than a day after it was created. Last night I was at an NUS event. 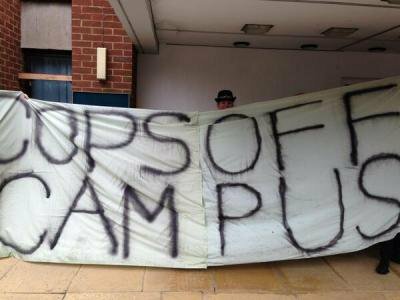 The organisation that condemned the Millbank occupation in 2010 was united in support for student occupiers and was appalled by police repression. All signs point towards the movement growing as a consequence of heavy-handed responses. These protests are escalating, and an increasingly authoritarian response from institutions will only steel the resolve of protesters. Students will not be cowed by the baton-strikes; they will only be determined to continue the fight. The movement is still young, and we don’t know how things will turn out. But it’s clear that the class of 2013 has learned from the mistakes and successes of 2010, and that whatever happens next in the student movement will have repercussions throughout the rest of society.